The foods you eat have a direct impact on your oral health. How can you make sure you are consuming foods that will reduce the risk of gum disease and tooth decay? Packing healthy lunches can go a long way toward keeping plaque and bacteria away. 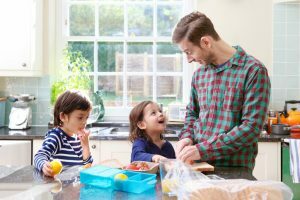 Our family dentist in Naperville has some excellent suggestions to help you pack healthier lunches for school or work! All fruit is good for you right? Wrong! Fruits are high in acid, which can start to eat away at your teeth’s enamel. If you aren’t rinsing your mouth with water or brushing soon after eating the fruit, those acids can lead to stains on the surface areas of the teeth over the years. Pack fruits that will not eat away at your teeth, and will promote healthy gums. Try eating bananas over grapes as they have less sugar and the potassium is more filling than sugary fruits. Apples are a great fruit to consider as their thicker texture you need to bite into can help to “scrub” the teeth. If you like applesauce, your Naperville family dentist recommends you opt for the kind that does not contain sugar to keep cavities at bay! Avoid the soda and juice drinks and fill up with water. Water is not only great for your health, it helps to wash bacteria from the mouth, reducing plaque buildup. If you hate the taste of water, flavor it with some lemons, watermelon, raspberries, or mint leaves. Plus, water can help you avoid stains on your teeth from coffee, tea, and soda. If you would like to brighten your smile, however, you are welcome to visit your cosmetic dentist in Naperville. Stay healthy by eating 100% whole wheat for your sandwich options. Whole grains paired with healthy aged cheese can be good for your teeth. Dairy does have an impact on tooth development, which is why cheese is beneficial for children as their secondary teeth are still forming. If you have stains, cracks, and other tooth decay problems, call your family dentist in Naperville today! At Sherman Oaks Family Dental, we are here to help solve all your tooth problems. Learn why Dr. Weyneth is known as one of the best dentists in Naperville. Schedule a consultation today and start your journey toward a healthier, happier smile!